The story of the three-year old boy from Florida who broke his femur while jumping on a trampoline and ended with the almost full-body cast has explosively circulated on social media this past Tuesday. With a blink of an eye, the story drew national attention and raised serious questions and concerns about the safety of an activity commonly known to be a cheerful and safe play for children. Kaitlin Hill, the mother of the toddler, shared an upsetting post on Facebook, where she explained the horrible accident and revealed the agony their family is going through during Colton’s recovery. According to her post, they were told that the repetitive pressure from the jumping may have caused the painful fracture. As a result of the severity of Colton’s trampoline injury, the doctors put him in a hip Spica cast for six weeks. Numerous national and local media outlets have quickly covered the story, highlighting the importance of increased security and supervision of the children while playing at the trampoline parks. 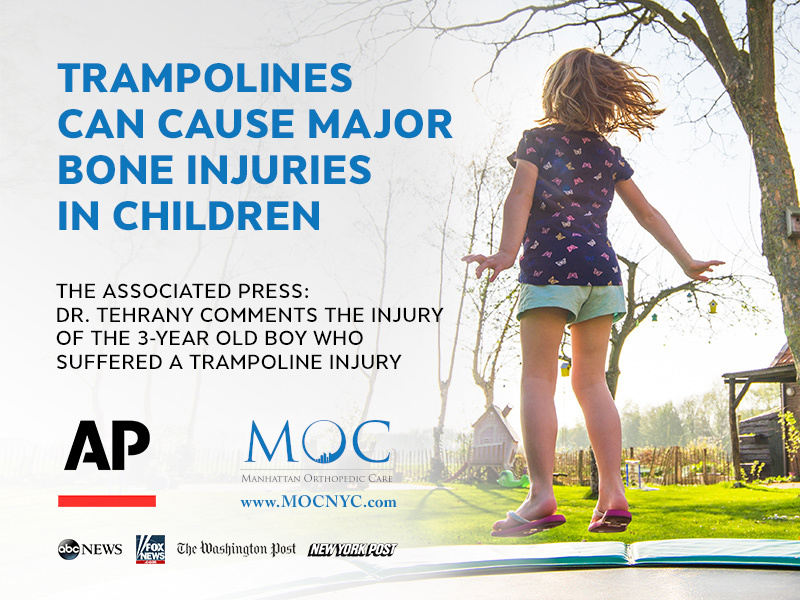 The Associated Pressed has covered the story with a piece that discloses the dangers associated with trampoline use for toddlers and children. For the purpose of the story, the editor asked Dr. Armin Tehrany, a vastly experienced and profoundly knowledgeable orthopedic surgeon, to provide a professional point of view on the story about the trampoline injury that shocked the entire country. According to Dr. Tehrany, the repetitive motions from bouncing on the trampoline can cause major injuries with bones twisting or breaking. Young children are exceptionally vulnerable to these injuries because their bones are still developing and growing. As a caring orthopedic doctor who is unreservedly protective of children’s health, Dr. Tehrany pointed out the importance of implementing the recommendations for increased safety at the trampoline parks that have been previously issued by the American Academy of Orthopedic Surgeons. Further, Dr. Tehrany applauds the initiative for further investigation and the enforcement of concrete actions and guidelines that will prevent such agonizing injuries at recreation parks. The alarming story and Dr. Tehrany’s expertise have been picked up by many media outlets, including The Washington Post Online, FOX News Online, ABC News Online, New York Post Online, MSN, and PIX11 NY Online. At Manhattan Orthopedic Care, we sincerely hope the young Colton will experience a fast and smooth recovery from this terrible trampoline injury. We strongly urge the parents to avoid allowing their toddlers do any kind of activity that can significantly impact and threaten the healthy and proper growth and development of children’s body and bones.